School of Francesco Guardi, View of Venice (detail), 18th century. Oil on canvas, 22 x 28 3⁄4 inches (55.9 x 73 cm). Collection of the Nasher Museum. Anonymous gift. The European Art Gallery illustrates cultural and aesthetic changes from the Renaissance to the dawn of the modern period (1400-1900) through a variety of objects, paintings and sculptures. A family enjoys looking closely at a painting within the European Art Gallery. The sweeping cultural transformations that occurred across the European continent following the Medieval period included numerous phases of war and peace, religious and social upheaval, and the creation of modern nations. During this time, the role of the artist changed as increased sources of patronage initiated a considerable shift in artistic production, and the wider movement of artists and artefacts provided for extensive artistic and cultural exchange. As a result, the works on view display broad material and regional differences, but also draw connections between formal, stylistic, and technical concerns of the era. The gallery begins with the Renaissance, a period of interest in ancient thought and forms, propelled between the fourteenth and sixteenth centuries by a growing merchant class and an increasingly wealthy Catholic Church. In the late 1500s and 1600s, many major religious reforms took place, resulting in new denominations and doctrinal changes within the Church. As a result, art from this period, called the Baroque, is often distinguished by a renewed emphasis on immediacy, clarity, and emotion. As the Age of Enlightenment arose in the late seventeenth century, a growing interest in scientific inquiry and social reform resulted in the displacement of devotional imagery by civic and historical themes. Neoclassicism emerged in the mid-eighteenth century and embodied these ideals through artistic restraint, harmony, and detail, often using classical subjects to reference contemporary concerns. Portraiture and landscape—significant themes in western art since antiquity—remained popular subjects around the continent and throughout the hundreds of years spanned in this gallery. The Nasher Museum’s Book of Hours (Workshop of Jean Bourdichon, c. 1490) is a fine example of 15th-century French manuscript production. It has 156 pages, including daily prayers for Christian devotion, a calendar of saints’ days and 13 full-page paintings, or miniatures, depicting religious scenes and vignettes associated with then-contemporary life. 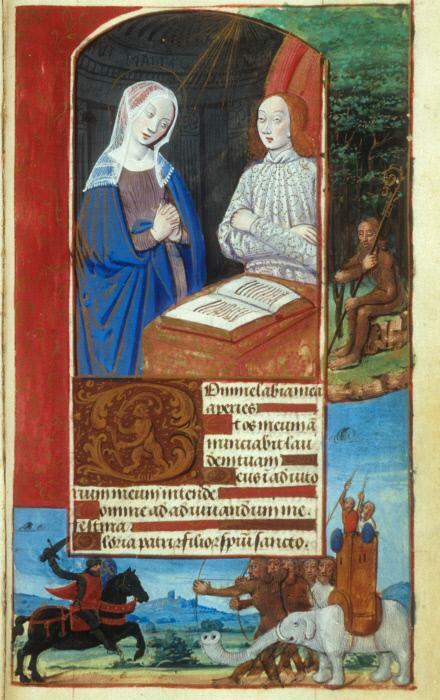 A Book of Hours was a private book containing daily prayers for Christian devotion. It was used mainly by ordinary people, rather than by priests or nuns. The content was adapted from the Psalter and the Breviary, religious volumes that contained psalms and liturgical texts. Its great popularity reflected people’s concern for a more direct and intimate relationship with the Virgin Mary and Christ, without the mediation of the clergy. By the fourteenth century, illustrated Books of Hours were commissioned largely by nobles and aristocrats and produced by lay workshops headed by celebrated painters, or illuminators. By the fifteenth century, bookdealers and these workshops supplied the growing demand of affluent townspeople. Often commissioned or purchased as wedding gifts, these books were usually passed down from parent to child. Although the original owners and artists are often unknown, the text and illustrations, or illuminations, can provide clues about their lives and religious practices. The miniatures and marginalia, or drawings in the margins, also provide a window into certain aspects of the Middle Ages and the Renaissance. Now visitors can explore these 13 richly illustrated pages in detail online. 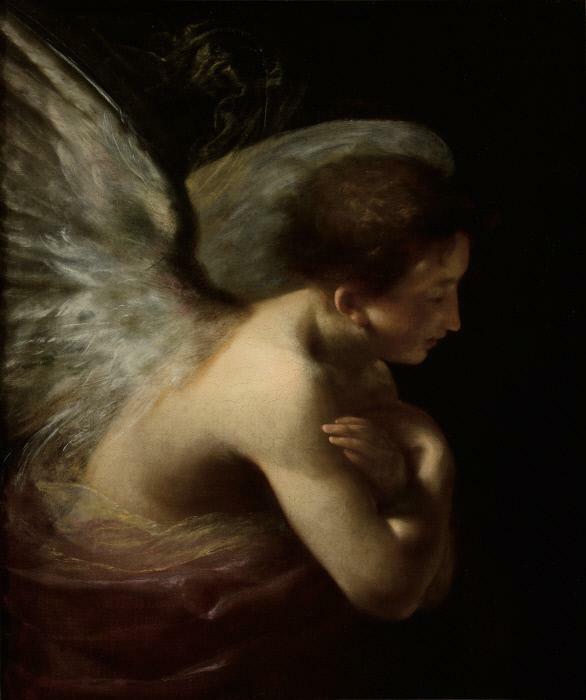 Francesco Furini, attributed, Angel, 17th century. Oil on canvas, 33 1/4 x 28 1/8 in. (84.5 x 71.5 cm). Gift of Joseph F. McCrindle. Claude Michel (called Clodion), Vestal Virgin, c. 1799. 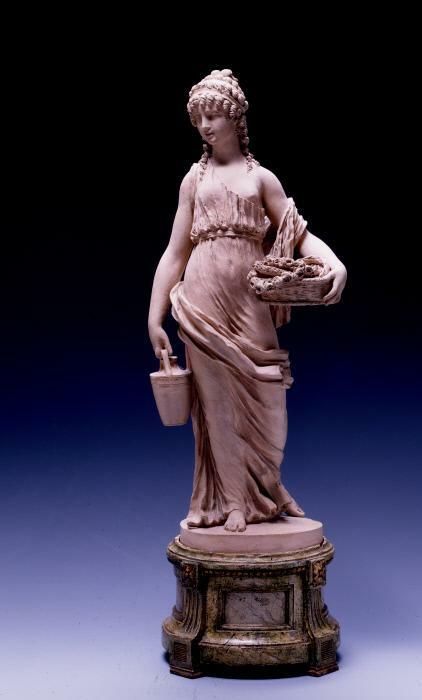 Terracotta with polychrome wood base, Height (with base): 17 1/2 in. (44.4 cm). Gift of Mary D. B. T. Semans & James H. Semans, M.D., in honor of Mrs. Mary Duke Biddle. 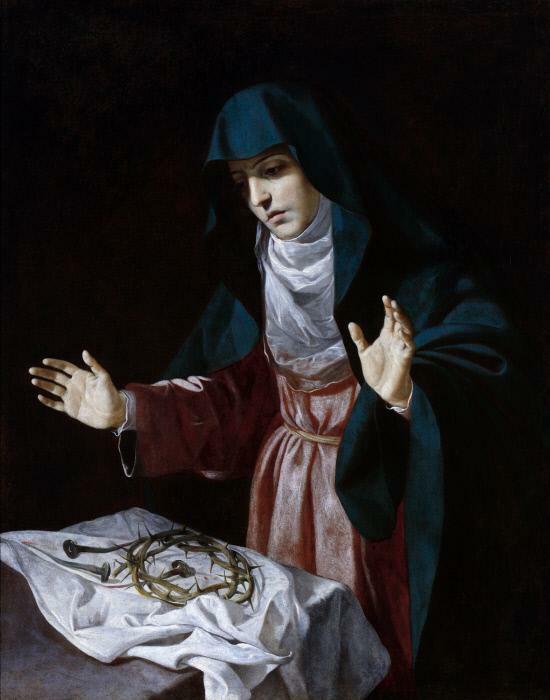 Vicente Carducho (attributed), The Virgin Contemplating Instruments of the Passion, c. 1620-1630. Oil on canvas, 52 5/8 × 43 1/2 × 4 in. (133.7 × 110.5 × 10.2 cm). Museum purchase with funds provided by the John A. Schwarz III and Anita Eerdmans Schwarz Family Endowment Fund. 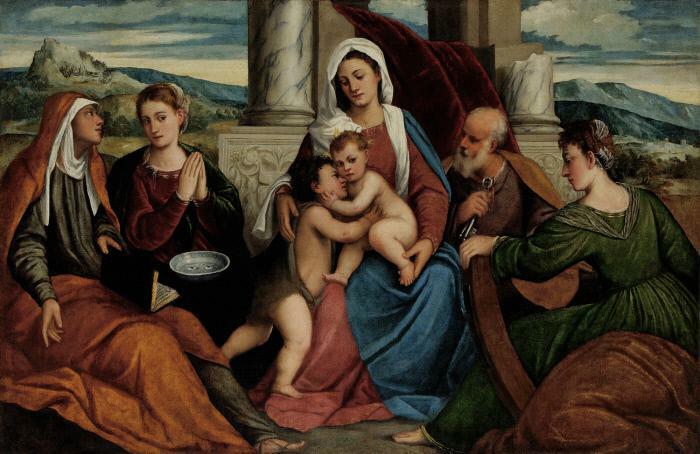 Bonifacio de' Pitati and Workshop, Virgin and Child with Saints Elizabeth, Lucy, the Child Baptist, Peter and Catherine, c. 1545. Oil on canvas, 44 x 68 in. (111.8 x 172.7 cm). Anonymous gift. 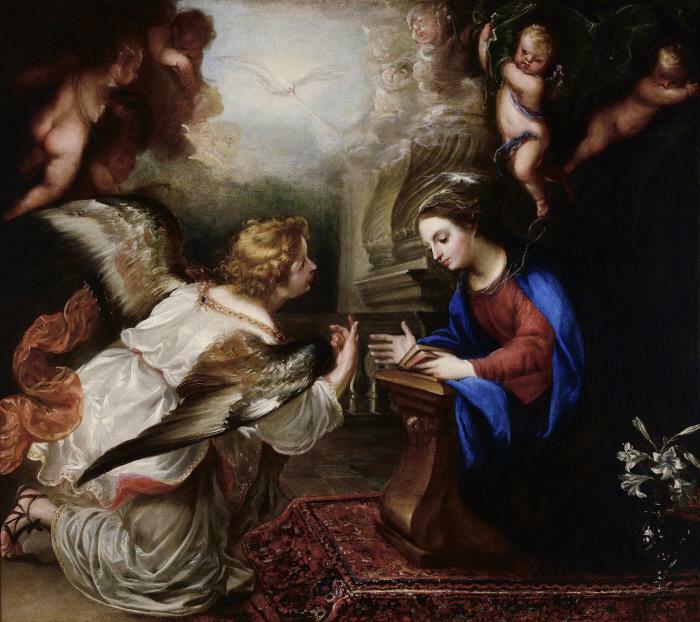 Francisco Rizi de Guevara, The Annunciation, c. 1640. Oil on canvas, 50 1/4 x 56 in. (127.6 x 142.2 cm). Gift of Harriet Dubose Gray and her son Thomas S. Kenan III in honor of James H. Semans & Mary Duke Biddle Trent Semans. 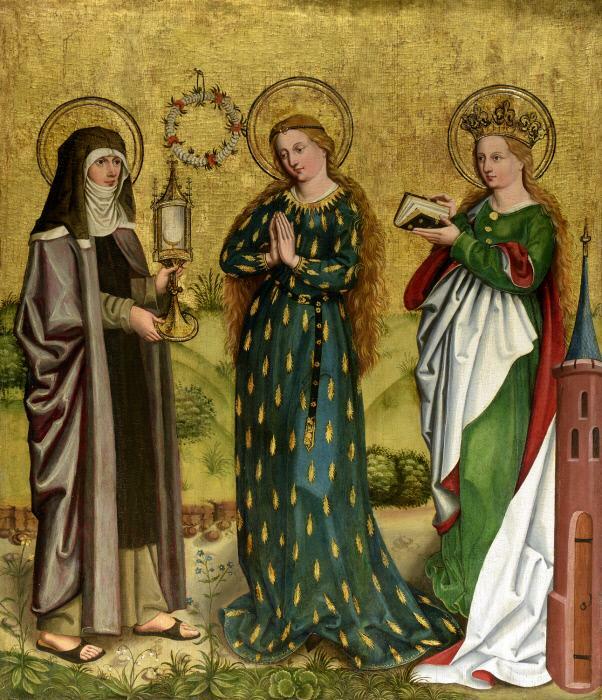 German, Three Standing Female Saints: Clare, the Virgin Mary, and Barbara, 1470–1480. Oil, tempera, and gold leaf on panel, 46 x 39 1/4 in. (116.8 x 99.7 cm). Gift in honor of Marilyn M. Segal by her children. 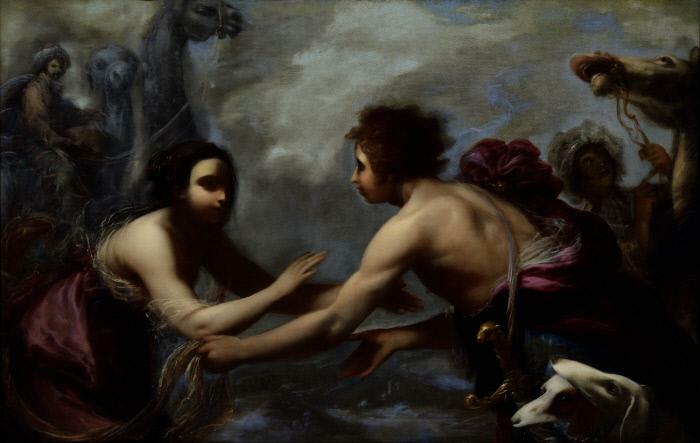 Francesco Montelatici (called Cecco Bravo), The Meeting of Isaac and Rebecca, c. 1660. Oil on canvas, 50 x 75 in. (127 x 190.5 cm). Gift of Joseph F. McCrindle. 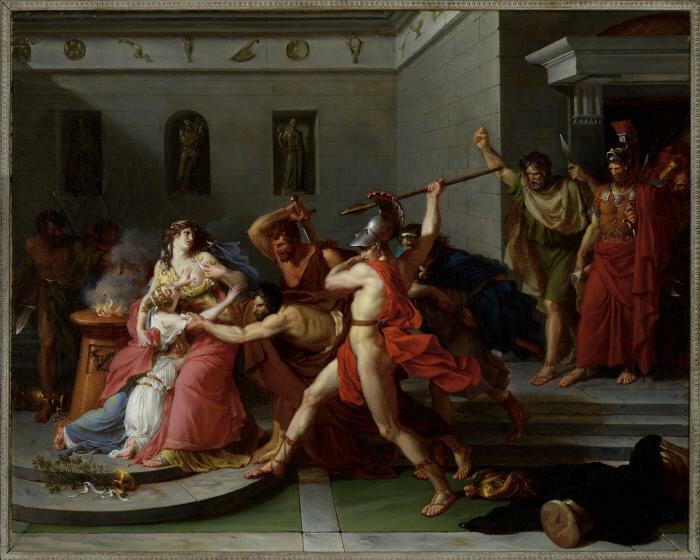 François-Pascal-Simon Gérard, Clytemnestra Receiving the News of Iphigenia's Impending Sacrifice, 1787. Oil on canvas, 30 1/2 x 38 1/4 in. (77.5 x 97.2 cm). Museum purchase. Workshop of Jean Bourdichon, Book of Hours, c. 1490. Tempera, liquid gold, and ink on vellum, Book closed: 4 3/8 x 6 15/16 x 1 3/16 inches (11.1 x 17.6 x 2.5 cm)Sheet - Each Leaf (page): 6 9/16 x 4 1/4 in. (16.7 x 10.8 cm)Old Green Leather Carrying Case: 8 x 5 3/4 x 1 1/2 in. (20.3 x 14.6 x 3.8 cm). Museum purchase. Slideshow of pieces within the European Art Gallery.